We’ve had an amazingly social weekend, which are my favorite kind! I had a chance to make a whole host of things, BUT, I thought I’d tell you about the easiest one I made (the least amount of ingredients AND took 25 minutes…tops). 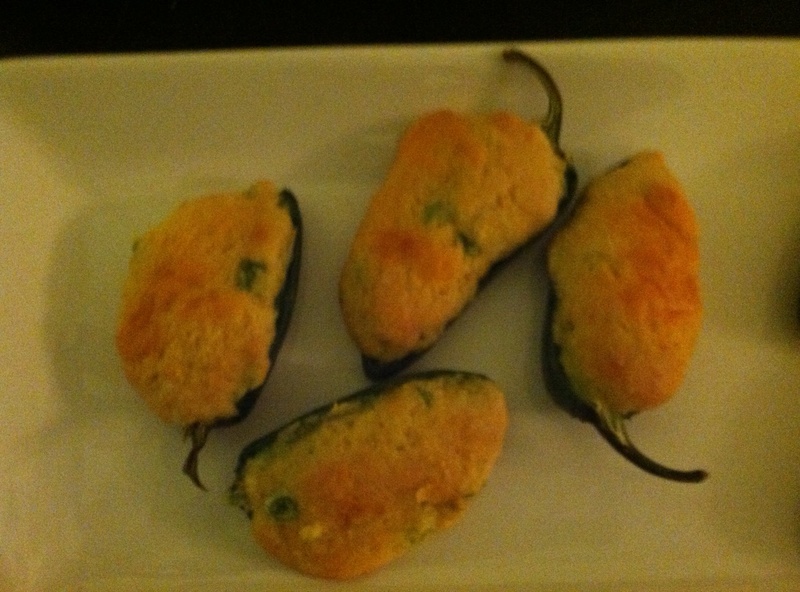 I bring you…Jalapeno Poppers. I originally saw a take on this recipe on Pinterest (well I saw a picture of this recipe), and you all probably know by now my aversion to actually making something verbatim on Pinterest, so…I took the picture, and modified. This morning I actually checked the recipe, and I want to give credit where credit is due. So you can find the picture of the recipe (and their version of it) here. I did make some changes, used a different cornbread, blah blah. This is what we did. I love Jiffy cornbread mix. I buy it in grocery store bulk (6 boxes at a time) for about $2. It’s quick, it’s easy, I always know what it’s going to taste like and I almost never use it as-is. Seriously, buy it. I’ll try to put some other recipes up here of how else it can be used (think of tamale pie, or skillet chicken pot pie, but using cornbread as the pot (or pie? As the top)). So as you may know, Zara LOVES to stir things up, and play in dry ingredients. Wash your child’s (and your) hands before you start cooking. I always think that’s an obvious point, but I realize I’ve never stated it. And while I’m ALL for letting kids get dirty and pass germs to up their immune systems, I’d like a respite from it in the bowl I’m cooking with. So wash, please. We do. Mix per the box instructions. While Zara is doing this (maybe I should start taking step by step pictures…that could be fun…) I wash, slice in half and deseed jalapenos. We used 6 medium for this recipe. I then had Zara grate about a cup and a half of cheddar cheese using a flat cheese grater. This way she could use her little body weight to help her. Add 1 cup of the cheddar to the cornbread mixture, reserve 1/2 cup. Now chop up 1 large scallion (obviously omit if you hate scallions, I love them! You could also use cilantro, this is really about giving your popper and herbal or grassy kick) and add to the cornbread mixture. Have your child stir until incorporated. Now add a shmear of cream cheese to the base of your popper. This is to have some creaminess when you take a bite otherwise the cornbread can be a little dry. (I feel I didn’t add quite enough last night, and should have added more) If I had to give a measurement to ‘shmear’, I would say between 1/4 to 1/2 teaspoon. Err on more, but know that you have to add the cornbread mixture on top and you want it all to fit. Next, have your child spoon the cornbread mixture onto the popper (I had her do this over parchment paper, so that you could scoop up any mess easily), smooth and cover all the inside of the popper. Top with reserved cheddar. Place all the poppers on a cookie sheet that is covered with parchment paper (for easy clean up!) and bake in a 375 preheated oven for 20 minutes. I miss Jiffy cornbread (so cheap & convenient; great resource). I also used to use it in a lot of different concoctions.